Dallas ‘Jean’ Whitlinger, age 79, of Marysville, passed away on Saturday, May 27, 2017, at Cambridge Place in Marysville. Viewing will be from noon to 8:00 pm, Tuesday, at Terry-Christie Funeral Home in Waterville. 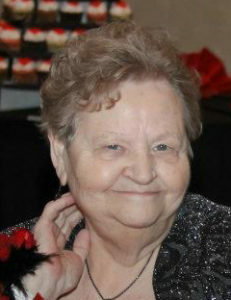 Jean’s family will received guests at the funeral home from 6:00-8:00 pm in the evening. Funeral services are planned for 2:00 pm, Wednesday, May 31, 2017, at the United Methodist Church in Marysville, with Pastor Dale Lewis officiating. The organist is Deb Landoll, who will accompany Mandy Cook and Wayne Kruse as they sing “The Old Rugged Cross” and “In The Garden”. The congregation will sing “Amazing Grace”. Casket Bearers are Justin Knecht, Dale Linck, Kade Smith, Dalton Roever, Fletch Tidwell and Donald Taylor. Honorary Bearers are Greg Taylor, Scott Taylor, William Rockwell and Lisa Nolan. Burial is at Prospect Hill Cemetery. Jean was born June 23, 1937, at Marysville, to Joseph C. and Alice N. (Fletcher) Tidwell. She married Jim McClung, they later divorced. She then married John Whitlinger, they later divorced. Jean worked as a Mail Carrier for the US Post Office, retiring in 1969 after an injury. She had a big heart and once you were in her home, you became family. Survivors include her two daughters Tami (Mark) Antoine of Marysville, Jennifer (Kade) Smith of Marysville, a son Todd Taylor of Denver, seven grandchildren, and ten grandchildren. Jean was preceded in death by her parents, a son Mitchell L. McClung, three sisters; JoAnn Walters, Joyce King and June Myers, and a brother, Abe Tidwell. Memorials are suggested to the funeral home to help with funeral expenses and may be sent in care of Terry-Christie Funeral Home at PO Box 61, Waterville, Kansas 66548.